DOOM first appeared in 1993, an id Software release that came on the heels of their popular Wolfenstein games. While the concept of the first person shooter video game was one that first appeared in the 1970s with Maze War and Spasim, Wolfenstein 3D (released in 1992) and DOOM are often hailed as inventing and cementing both the popularity and the earliest true tropes of the genre. Both games were wildly popular upon their release. DOOM, thanks partly to its release as first-taste-is-free shareware, was so successful that by late 1995, it was estimated that DOOM was installed on more computers than Windows 95. 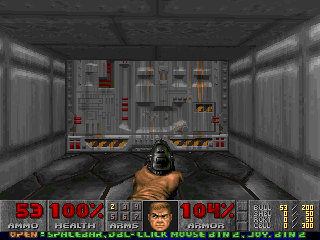 Much of DOOM‘s popularity was also due the fact that it was simply a fun and intense game to play. The 3D graphics were dazzling for the time, and unlike in Wolfenstein 3D, the gameplay happened on multiple levels of height (you could ascend stairs and peer over ledges). I personally remember being introduced to DOOM in 1993 and being genuinely creeped out by the dark atmosphere and haunting use of sound. Playing on a computer in a dark basement was a great recipe for getting the heebie jeebies. Gameplay involved a leading a space marine (usually called Doomguy by players) around an abandoned space station on Mars, where a gate to Hell has opened and spewed forth assorted demons. The goal was to massacre as many demons as possible. And, really, that was it. Back then, that was really all we needed. 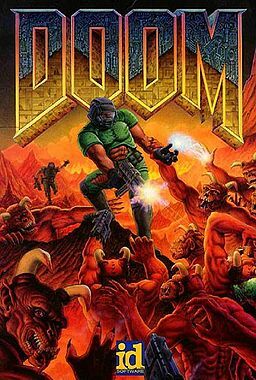 According to DOOMWiki.org, the sound effects for DOOM (as well as its sequel, DOOM II) were compiled by Bobby Prince, a retired composer and sound designer who wrote the music for the game. The sound effects mostly come from a massive commercial sound library created by Sound Ideas, including the door sounds. After the release of DOOM, these door sounds (as well as several other game sounds) have started showing up from time to time. Sometimes, the sounds show up simply because they were selected from the same Sound Ideas commercial library. At other times, the door sounds are deliberately referencing DOOM. In 2005, twelve years after the game decreased productivity all around the world, DOOM spawned a movie. The film starred Karl Urban (whose character was sadly not named Doomguy) and Dwayne Johnson (aka The Rock). It’s a fairly terrible film, possibly because the original game was built more on environment than plot, and nobody really knew what to do with that. In a baffling move, the film did not tap into those now-famous Sound Ideas effects for the doors in the Mars facility… except for the scene that most folks deem to be the best in the film. Near the end, the film finally turns into what fans of the game had been waiting for: a first-person demon-riddled bloodbath. TV Tropes has a fairly thorough list of DOOM Door appearances, so I won’t attempt to replicate it here. I’ll just hit some highlights. The TV cooking show Good Eats also occasionally uses a DOOM Door noise. In the 2006 episode of Dr. Who named “Impossible Planet”, DOOM Door noises show up in the space station. They also showed up in the Dr. Who sister series, Torchwood, as part of the episode “Cyberwoman”. People swear up and down that one of the DOOM Door sounds shows up in later episodes of Mystery Science Theater 3000, during the door-opening/door-closing sequences that occurs between the skits and the movies. I personally don’t hear it, but it is probably mixed in with several other sounds and therefore is heavily disguised. Where have you heard the DOOM Doors lately? I know I’m more of a Doom nerd than a foley nerd, but if you want another subject to talk about, the Imps from Doom seem to rely entirely on stock sound effects from camels! I always quickly (and panickedly) identify the gruffing, snorting, wailing noises for Imps in any movie that has camels in it. I guess I sort of figured this would reveal some new information about the actual foley of the DOOM door noises. I left this article sadly disappointed. You can download the Descent (door) sounds here, none of which exactly sounds like any of those 4 Doom door sounds. It’s also used for automatic doors in the 1997 WB movie “Die furchtlosen Vier” (the fearless four), along with another monster sound used by troops in Duke Nukem 3D. So I guess that the Sound Ideas library noted above also contains some sounds Bobby Prince used for Duke! It’s used in episode 134 of Fairy Tail also, with the moving blocks.